Statement earrings are so 2016, and Joden is THE place to find them. 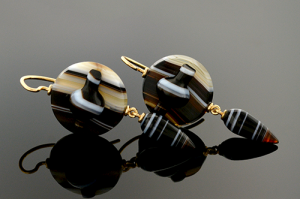 From a pair of Georgian diamond dangles, an eccentric pair of banded agates or classic Victorian tassels, the possibilities are as unique and diverse of the ladies who wear them. Girls have been using ear piercing to express their independence in the United States since the 1950’s. It has become a Rite of Passage for American girls… a small but significant step in the journey from little girl to young woman. By the 1960’s, girls were using ice cubes and needles to poke holes in their ears; and by the 1970’s, ear-piercing kiosks were in every mall in America. During the early days of Joden, Joe (the owner) pierced hundreds of ears – thereby turning all those girls into dedicated customers for years to come. Groups of women are always popping in to Joden. Ladies love pouring over the cases, ooh-ing and ah-ing over the Art Deco gems and modern bling. 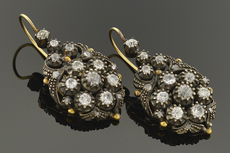 When they walk back out the door, Joden bag in hand, more often than not, its earrings – gleaming gold hoops, Victorian chandeliers, or even a pair of large diamond studs. These are statement earrings. Stop in and choose a pair for yourself. Be the first to see the next blog. Sign up now. No one comes to Joden by accident. Everyone who walks through the door does so intentionally. Drawn here by stunning billboards, glossy magazine ads, or the recommendation of a friend. For each of these people, Joden is a destination. People come to us for the extraordinary – the rare and unusual. Be it vintage or modern, Joden is a haven of unique treasures. Eclectic inventory tends to attract eclectic clients. 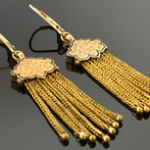 Our customers are nontraditional people looking for statement pieces. Many of them are collectors looking for exceptional acquisitions. Quite often, a first-time buyer – a vintage virgin, if you will – is quickly converted to a collector. 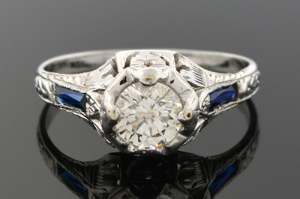 Many times this is sparked by a charming antique engagement ring, like the one pictured above. This ring was crafted in the mid-1920’s of 18 karat white gold. 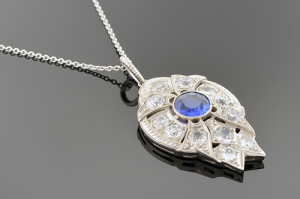 The carved mounting features a dazzling round diamond center accented by a pair of baguette cut sapphire sides. This is a ring that leaves a girl wanting more. The platinum sapphire and diamond pendant and the Art Deco circle pin pictured next are perfect companions for this ring. 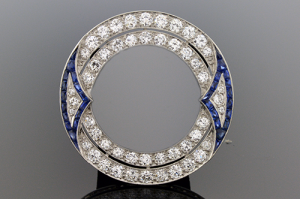 Both feature rich blue sapphires and round brilliant diamonds. These and countless others are waiting for you. No matter what kind of jewelry sparks your passion, the journey begins with you and ends when you reach your destination, Joden Jewelers. 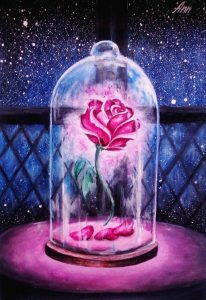 The enchanted rose (pictured above) is an iconic symbol from Beauty and The Beast. The story is woven around this perfect blossom. As the tale unfolds, the rose begins to wither and will ultimately die. Only true love can save the day. Recently, we purchased our own enchanted rose (pictured below). The moment I saw it, I immediately thought of Beauty and The Beast. 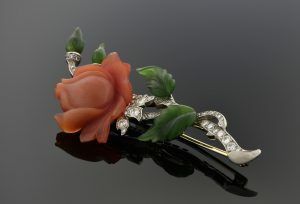 This piece, made in the 1950’s, implements perfect Edwardian style. The stem of the bud is constructed of platinum with a white gold pin stem. Round brilliant diamonds were set into the stem, adding the perfect amount of sparkle. The rose petals were carved from a singular piece of salmon colored jade, and lifelike leaves have been sculpted from four pieces of green jade. Each element combines to create this fabled flower. Sure to be an instant favorite, its beauty will never fade. Our enchanted rose is the perfect beginning to your own fairy tale.